Well, it’s a relatively slow Saturday night again, and thought I’d post a little something to reflect what I think Saturday nights should be. Namely, taking a break from some of the things that can sometimes weigh on us. This would include some of the scientific and deep thinking stuff on this forum! Anyway, my wife recently had an experience involving a white hawk. Since neither of us knew whether white hawks even existed, I did a little searching and discovered they do. I also found a picture that I thought was quite striking and beautiful (below), so thought I would share it here tonight. I also thought I would send along some quotes (not mine) referencing the hawk as a good omen in a person spiritual life. Hope you enjoy the pictures and the quotes. In the traditions of some Native Americans, the hawk is a messenger of God. Its appearance is a blessing, for it alerts an individual to go to the spiritual mountain and employ the gift of godlike vision. A hawk is a good spiritual omen. According to Native American legend, the hawk’s cry –- a shrill whistle –- is to pierce the awareness and awaken people to a state of full awareness. The whistle of a hawk is like the cry of a prophet. So the symbol of a hawk is about having a clear spiritual vision. The sharp whistle of a hawk is one of the best images to appear in your spiritual life, for it holds out an offer of love, wisdom, and spiritual freedom. Listen for its cry tonight. ETA I couldn't seem to get the image to enlarge, but if you click on it, it will do so. Click here to go directly to the online picture. Thanks Wayne for sharing this lovely image. I love watching the red tail hawks around here, but have never see a white one. Will keep my ears open to the cry. 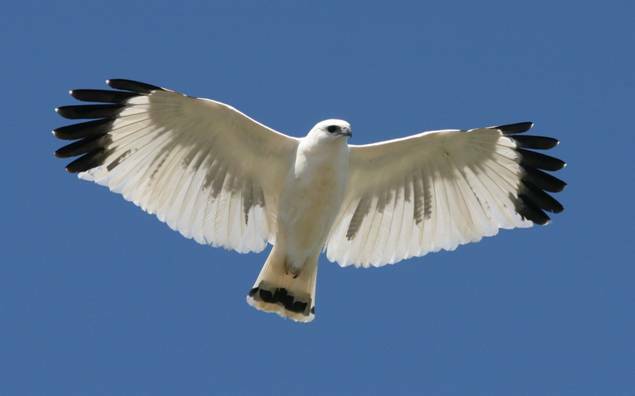 I have also never seen a white hawk. What a beautiful bird! As far a larger birds, I have eagles, red-tailed hawks, osprey nearby, as well as 3 different types of owls. I love to awaken to the sounds of the wee songbirds. Thanks for this thread, Wayne. Wayne......Great thread. I have always felt a connection with raptors, especially hawks....and more so than any other bird or animal. There are many raptors here where I live....mostly Redtail and Osprey. We see them often......But, there are those special times when the bird comes into my path in a way that is with intent for connection with a message of deeper meaning. I love those times....I feel honored and humbled when they happen. Wayne, thanks for the hawk post, it's a good reminder. Of course I was trying to figure out what kind of hawk it is; the only close-to-white hawk I've seen is a Cooper's hawk, but this one looks bulkier than they do. I have noticed for the last twenty years (since my father died that I was very close to) that whenever I least suspect it, I will see a hawk as I am traveling in a car....etc. Most of the time, it's at a time when I am needing a little "lift." Yesterday I was sitting on my mom's condo upper porch with her, after spending a fun day eating out and then cooking at the condo with her. She has alzheimer's but is still living independently, with the help of myself, and two sisters. I saw this HUGE white hawk, and have never seen this before, with the wing span of a human. It was quite etheral, and I felt it was a definite message from my father. It was awesome!! That's really wonderful Sheila. I would feel the same. Thanks for sharing. This is the time of the hawk migration, eagles, and many others, sweeping down from Canada through the NE to where there is open water all winter. I thought some of the replies on this thread were striking and beautiful, and thought I'd bump it up for others to enjoy. Also, ahimsa had posted a question about what kind of bird was pictured in my avatar. I thought some of the replies on this thread were beautiful, and thought I'd bump it up for others to enjoy. Thanks, Wayne, for the response to my limerick! (for those who don't know what I'm talking about see http://forums.phoenixrising.me/showthread.php?14081-LIMERICK-YOUR-FRIENDS!&p=211837#post211837 ) These silly limericks were supposed to include something about the user member if possible. Since I'm a bit of a bird watcher, and since my own avatar photo is a bird, I thought asking about your avatar photo would be fun. I really enjoyed the larger image of that white hawk - just beautiful! It looks like that particular photo was taken in Belize? (see http://www.markprettinaturetours.com/belize_photo_gallery.htm and scroll down) I've also heard of people seeing albino versions of various hawks (e.g., red tailed hawks). I know this is way off topic from spiritual omens but I wanted to let you know I saw your message. I don't know much (okay, I don't know ANYTHING!) about that topic so I've learned a few new things from this thread. Thanks for some of your striking comments on this thread. It's getting to be about the time of year again, when many magnificent "birds" make their pilgrimage down from Canada. Thought it might be a good time to share some quotes (below) referencing the hawk as a good omen in a person's spiritual life. A hawk is a good spiritual omen. According to Native American legend, the hawks crya shrill whistleis to pierce the awareness and awaken people to a state of full awareness. The whistle of a hawk is like the cry of a prophet. Thank you for that information on White hawks and the spiritualism behind it. About 30 years ago i was going through a really hard time and dreamed of a large white hawk. I've always wondered what it meant and now i know. Also whenever i have something heavy on my mind i will usually see a hawk. Usually a red tail. I'm also part Native American and proud of it. Thank you so much for clarifying this for me. I have noticed for the last twenty years (since my father died that I was very close to) that whenever I least expect it, I will see a hawk as I am traveling in a car....etc. Most of the time, it's at a time when I am needing a little "lift." Yesterday I was sitting on my mom's condo upper porch with her, after spending a fun day eating out and then cooking at the condo with her. She has alzheimer's but is still living independently, with the help of myself, and two sisters. I saw this HUGE white hawk, and have never seen this before, with the wing span of a human. It was quite etheral, and I felt it was a definite message from my father. It was awesome!! Thank you for sharing your remarkable experience (I should have thanked you two years ago when you first posted this). If you still visit this forum, hopefully you'll see my reply here today. I just love to hear experiences like this. Sorry I didn't reply to your post earlier. Thanks much for sharing your experiences with hawks. I always enjoy reviewing some of the quotes I posted on this thread regarding the spiritual significance of a hawk showing up in our lives and am happy to hear they were so helpful for you. Thanks for this post, Wayne. Until just a few eeks ago I did not know there was such thing as a white hawk. I have recently encountered this magnificent creature twice in Norrth-Central Washington State. According to wikipedia, the white hawk's normal distribution is in the tropical America's and so I am unsure what they are doing in the Pacific Northwest. I'm happy that I'm not the only one who has seen one. Anyway I happened to have a camera with me during the second sighting and although the images are distant, you may be interested in checking them out. Hawks kind of link in with the cfs journey for me. Not long after health really started to deteriorate, I moved to the countryside wanting to be in nature and I saw a couple of hawks quite regularly in the area. Health continued to plummet during those few months in the country and I had an epiphany about moving back home to my parents on a particular day while I was there - I felt so strongly it was the right thing for me to do in order to start feeling better and later that same night, I came across a hawk in the field that seemed to have recently died. I had a good look at it and couldn't see any puncture marks or anything so could only assume it was of natural causes, just remember feeling so blessed to see it so close, as it's always struck me that you never really see dead birds around and I have often wondered where their bodies go. . .
Now I'm at home, there are another pair of hawks I see quite regularly here too that never used to be here when I was growing up and I always get great feelings upon seeing them, adore watching them actually. Always feels like they give me wings - maybe when we have sightings, they could be helping us to find them?